With Daventry Country Park still having problems with weeds Two Islands very kindly stepped in to allow us to run the September round of the Martin Dale Cup at Furzton Lake. In line with my promise last month I got to row about and set the course for this months Martin Dale Cup. As the wind had shifted around to come from the north we started with a reaching start rounding the first mark to port. A gate was set down wind and then we had two laps of the upwind/downwind course before rounding the final mark close to the shoreline and a tricky final leg with the wind bouncing off the bank affecting how close you could get to the shore and your route to the finish line. The early wind was light then it built somewhat to fall away again towards the end of the days racing. 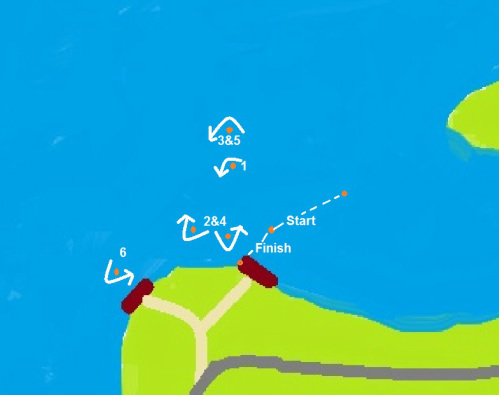 The reaching start is an interesting way to get the racing underway the line is set so that there is a starboard bias along it's entire length with the shortest distance to the port rounding of the first mark towards the leeward end. In order to take advantage of the shorter distance a skipper has to sail closer to the wind, which is possibly slower, therefore the challenge becomes finding the optimum spot on the line and then judging the time and distance to hit the line at maximum speed. At this event a number of skippers returned to running down the line from the windward end however when they came across a boat sailing it's course and trying to judge time and distance they ended up either having to take avoiding action or fouling the boat to windward. Practicing good boat control at slow speeds is a considerable help on this type of start. It was very close between the top three all the way through the event with Paul Risdale (515) Gothic 54 having a slight edge in these lighter wind conditions, Mike Ewart (36) sailed his Dragon Force RG65 on it's DF top suit and inherited second place when Peter Shepherd (165) Abracadabra had equipment problems in two races later on, fair play to Mike for making it such a close battle and being in a position to benefit. I think it is fair to say Peter Jackson (305) Wizard struggled to find form today with consistent third and fourth places, always in the hunt but never quite making it stick perhaps the fact that the course was going away and coming toward had an effect as the distance perception is harder to judge. Richard Doleman (80) Dragon Force RG65 struggled at first with his set up, once a few tweaks had been made mainly involving taking away much of the tension in the backstay and foresail luff and lowering the foresail as far as possible the dragon appeared to become more responsive, unfortunately he was only able to complete ten races before duty called and he had to leave. It is fair to say Tim Lees (93) Puma RG65 has been the most determined of this season's new skippers, after a bit of helpful sail tweaking he was sailing as well as I have seen him go, in race six he should of had a win but got mugged on the line when the whole fleet, who were in close attendance, slipped past. The pressure of being in the lead got to him and he made a poor choice to tack out from the bank only feet from the line and ended up in irons, fortunately he was able to make amends in the very next race coming a very creditable second. Later on he had a third place and was much more involved in the racing throughout the day which was good to see. Thanks to all the participants for a fun days sailing, the final Martin Dale Cup event will be held on the 18th October 2014, hopefully we will be able to return to Daventry Country Park however check your email before setting out as the venue may have to change.